Last month I was given an incredible opportunity: to live my ideal life. It had been awhile since that I was that happy and fulfilled so I decided to give myself a chance to adjust to it. I took a Time Out in a self-imposed Time-Out Chair. Parents do this to calm a child, to help the child relax, be quiet, be with him/herself, have less distraction, and soothe the mind and spirit. As adults, who does this for us, if not ourselves? My Time-Out Chair experience was a long time coming and desperately needed. As a health coach, I educate and support my clients around better nutrition: for their minds AND bodies. When it occurred to me that I wasn't being a very good example, I decided it was time for a Time-Out. This is my experience about walking the walk toward better health. For the past several years I moved from job to job, location to location, partner to partner failing to find inner peace or fulfillment. Recently, things came into more focus. I had kept myself running for a reason, and I was ready to stop. But before I was able to transition from a life of chaos and insecurity, I knew I needed to create intentional time to transition into a life I had once only dreamed to be possible. When I was offered an opportunity to become part of a community that was aligned with my core beliefs about health for oneself and a community, I CHOSE to take this new opportunity and disappoint my employer; choosing my own happiness in itself a milestone for me. I found myself marking a successful amount of months in a committed relationship with the woman of my dreams. While challenging, it was only of the best kind: the type that makes each person stronger, more mindful and more compassionate and patient. My health was improving each day as I nurtured my body with fresh, locally-grown whole foods. All that remained was the time and work necessary to heal my spirit and mind, from all the chaos and DRAMA that had been my reality for many years. I knew that without that intentional time to grieve, heal and process, I would bring all of that "storyline" into my present and future. I chose to take a retreat at the Kripalu Center for Yoga and Health in Stockbridge, MA. I took that TIME OUT intentionally to create space to heal, center and renew. I am extremely grateful to the Scholarship Committee who provided me a generous scholarship to join their community. I added this gift of abundance to the long list of many gifts I have received since starting to intentionally expect and be grateful for abundance and wealth (often money, but often not) in my life. Make a list and see what happens to you! While at Kripalu, I enjoyed the time I had created to heal the past and make room for a new happy and bountiful life. It wasn't hard to find the time because I made it. That was my intention, to not live by a clock or calendar dates but instead to set a pace for my life that included all the necessary components to be happier and healthier. Running the rat race wasn't winning me points. It was making me sick and tired, of being sick and tired. It is definitely worth sharing that, like an upset, overstimulated child in a Time-Out Chair, my first 24-36 hours on retreat were spent in emotional discomfort as I adjusted to the serenity, peace and regulated pace/schedule that was lacking from my own life. A tantrum or two may have occurred. But soon I settled down, as a sobbing child does, and my sobs quieted to whimpers and eventually to serenity. I noticed this. I sat with it. I smiled about it. I embraced it. And then I enjoyed my time on retreat, a gift-wrapped few days of invaluable serenity. Since returning from Kripalu, I enjoy a daily pace that feels much more manageable and appropriate. I can be more present for myself, my partner and my clients. I eat better, I sleep better and I have more patience. My entire life has changed for the better, all because I stopped, took a time-out and reset my priorities in order to fully appreciate and enjoy the new life that I had created for myself. I mean, that's the point, right? What is one thing you can do to stop the hamster wheel from spinning? What have you created to keep yourself sick, tired and unhappy? 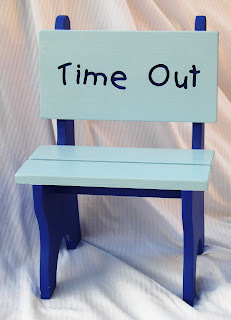 What would your life be like if you put yourself in the Time-Out Chair?